pseudoparanormal: Bigfoot, Real or Guy in Ape Suit with Too Much Time on His Hands? 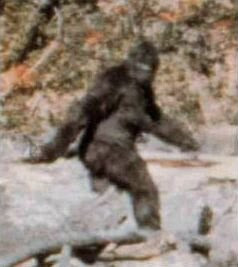 Bigfoot, Real or Guy in Ape Suit with Too Much Time on His Hands? The existence of "Bigfoot" has been one of the the most well known myths in our culture, with thousands of "sightings" and "encounters" reported in the news, this non-existent beast has become a celebrity over the years. Bigfoot is a great example of what pseudoscience is, and how it can flourish over the public. There is an enormous amount of people in the world that will not budge on the fact that this beast is currently strolling around somewhere in the woods, waiting for another lucky bystander, to shoot that million dollar photo of him. There are even research organizations completely dedicated to finding more evidence of Bigfoot's existence, BFRO (Bigfoot Field Research Organization) being the oldest and largest. Animal Planet recently launched their new series called Finding Bigfoot, which follows around "researchers" on their quest to find the ficitional beast. Their is no absolute, concrete evidence that Bigfoot does not exist, but well say that the scientists' and rational thinkers' side is winning by a tad. Almost every scientist out there shuts out the fact that this beast could be skipping around our woods here in America. One would think that after investing so much time and energy into something that has basically been proven as pseudoscience, why waste your time. Many other people believe otherwise. Because the myth has become so popular over the decades it opens opportunities at money for hoax pictures, which can further skew the credibility of any real evidence found. I believe that the psychology behind the farfetched myth is that it is simply more entertaining to believe that there is some giant, hairy sasquatch walking around out there. People that live pretty plain and boring lives can get excitement from the suspense that one day they might encounter Bigfoot, I mean a guy in an ape suit with too much time on his hands. I've actually watched Finding Bigfoot a couple of times, and all I can do is laugh while I watch. Even in a show dedicated to proving Bigfoot is real, there is no evidence whatsoever, besides a bunch of people claiming they've seen him at one point or another. Definitely one of the most outrageous shows I've ever seen.